Noticed the gap between the entries for the past two weeks? In case you wonder (and if you didn’t, you heartless cad), I was very sick for an entire week. It started with chills which escalated to high fever. I couldn’t walk properly, I have to be driven to the clinic. To my horror, my doctor told me it could be dengue fever (which was not – it was a case of infection). For one week, I was very miserable. The only thing I could stomach was plain rice porridge. The smell of protein (meat, eggs) made me want to puke. Right before I got violently ill, I made tacos. I have not been to Mexico but I love tacos. They are like these little pockets of snacks – they are so simple – nothing elaborate or pretentious about them. Till this day, the best tacos I had were from Maxwell Street Market in Chicago. Maxwell Street Market is a Sunday flea market where stalls sell all sorts of knick knacks – remote control, vinyl records, screws and bolts. What I love about the market was that it was not touristy hence it was not very crowded. The food at this market was amazing. You could get Polish sausage, cartons of fruits – people were very friendly – one stall owner gave me a peach even though he knew I ain’t going to buy a carton of peaches from him. At the end of Maxwell Street Market, there was a conglomerate of Mexican food stalls. My best friend, Agnes (at that time she resided in Chicago) and I simply chose a stall and shared some tacos. 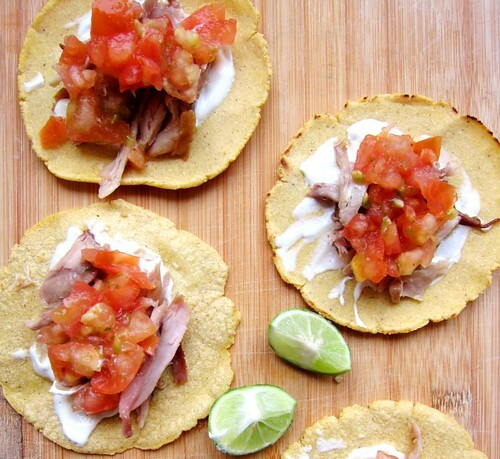 They were so good – corn tortilla with some meat and salsa. Simple grub. Here in Singapore, it took me quite a while to find masa harina – the main ingredient needed to make corn tortilla. Thank god for Bob’s Red Mill – I managed to grab a pack (after three trips to Jason). When I opened the packet, it smell heavenly – it was like concentrated dried corn. Before I start making tortilla, I got to “consult” the guru in Mexican cuisine – Rick Bayless. It was then I realised making tortilla was not that difficult – you just need masa harina, water and a bit of innovation. Since I don’t have a tortilla presser, I used the back of my small frying pan. You do not need to get it perfectly round (trust me, the stomach will not judge you), you just try to get it as thin as possible. I also made a simple salsa for the tacos. For the salsa, I kept it really simple. This was also the point where I had a Homer Simpson’s d’oh moment*. I was in the supermarket, hunting down cilantro or coriander which was the pivot of Mexican food. I just couldn’t find it. I even resort to sniffing the herbs to find a close substitute. In the end, I was unsure so I did not buy any. After I googled, I realised cilantro was also Chinese parsley which was plenty in the market. And I sniffed it. My god, am I dumb or what? Anyway there was no cilantro or Chinese parsley in my salsa. For the protein, I used some leftover roast chicken that I had in my fridge. You can use pork, fish, shrimp, mushroom, spinach and so on. For the second time I made tacos, I pan-fried some chopped chorizo and corns. I have to say the tortillas were fabulous. They were better than the ones from Spruce Tacqueria. The first bite, I felt I was transported back to Maxwell Market – the smell, and you can taste that corn in the tortillas. The salsa was light and refreshing, and it cut the fats in the meat. So please I urge you to go grab a pack of masa harina and start making your own tortilla. Your life will be transformed. I promise. Hola! - Pour the hot water bit by bit into the masa harina and mix it with a fork (if you feel brave, go ahead and use your hands. Be warned, you are playing with HOT water). - Once the mixture has come together as dough (which should not be too stiff or wet), let it rest for 15 minutes. - Once 15 minutes is up, divide the dough into 7 pieces. I usually use a weighing scale and divide them accordingly. Once done, wrap the divided dough in plastic to prevent it from drying out. - Before you press your dough, shaped it into a round ball. At this point, if the dough feels stiff, wet your hand and gently shape the dough. This should help to loosen the dough. 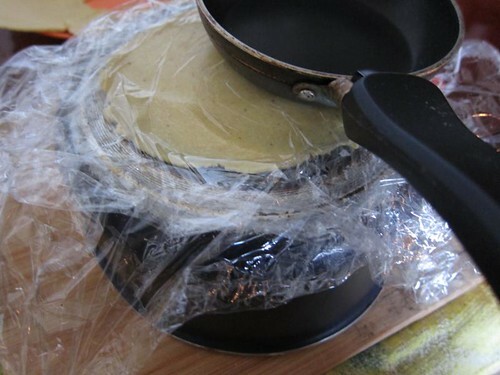 - If you have a tortilla presser, lay a piece of cling wrap and put the dough on top. Press the dough gently on the presser and put another piece of cling wrap on top of it. And close the tortilla presser. Once done, remove the tortilla and repeat for the rest. - If you do not have a tortilla presser (like me), you can use the bottom of a frying pan. Line a chopping board with cling wrap, put the dough on top, press it gently, and cover it with another piece of cling wrap. Use the flat bottom of the frying pan to press. You might need to press out the edges. It is ok that you do not get a round tortilla. The most important thing is that the tortilla is evenly spread and thin. - I like to line each flatten tortilla with either cling wrap or parchment paper. In this case, they will not stick. - Heat up your non-stick pan (you can use a skillet) and place a tortilla, and dry fry for 30 seconds on each side. Don’t be alarmed if the tortilla puff up – that is the way it should be. If the tortilla does not puff up, you can gently press it with a spatula or fingers to encourage it. 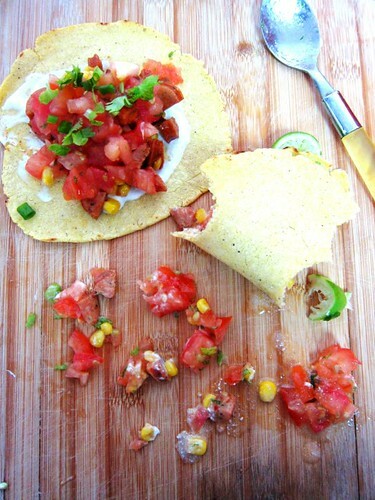 - Once the tortilla is cooked, transfer them to a plate lined with paper towel. - To ensemble your tacos, I like to line the tortilla with a thin coat of sour cream. This helps to prevent any drippings from making the tortilla soggy and possibly tearing it. Top the tortilla with leftover roast, roasted vegetables and so on. To finish, top it with some salsa and cilantro. Serve it with a wedge of lime. - Chop up a medium sized tomato. You will need to dice it coarsely and put it in a bowl. Do not waste any juices so make sure the juice from the tomato goes into the bowl. - Roll the lime*** and finely zest it into the chopped tomato. Be careful not to grate the white rind – they are rather bitter. - Sprinkle a small pinch of salt and add in the juice of half a lime into the chopped tomato (with lime zest). Taste and add in more salt or lime juice needed. - Garnish it with the chopped cilantro and a sprinkle of Korean chilli powder. - You can make the salsa 1-2 hours in advanced. If you leave it in the fridge any longer, the salsa will become watery. *While I was trying to construct the recipe, I realised I wrote in my notebook, the different names of cilantro which includes hey guess what, Chinese parsley. This will haunt me for life. **If jalapeño is readily available, you can add in half of deseeded finely chopped jalapeño in the salsa. In my case, jalapeño is something that I need to get it from a specialty shop hence I used Korean chilli powder as substitute. ***Rolling the lime (or any citrus fruits) helps to release both the juice and oil. Hence you get a flavourful zest and more lime juice. Looks good! 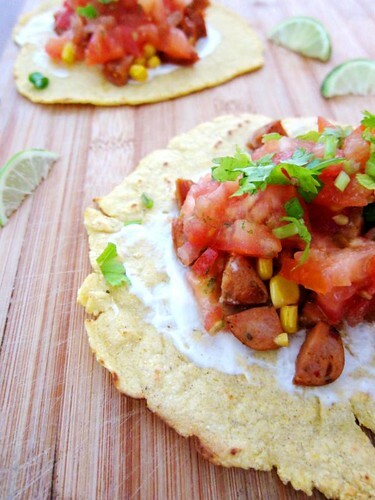 Think will try the salsa, and chorizo and corn version, with STORE-BOUGHT tortillas! Haha! I painstakingly pen down the steps and you go buy store bought tortilla!! Hi, Singaporean reader here! dying to make some corn tortillas myself and was wondering which Jasons supermarket you managed to find masa harina at? There are so many Jason’s these days, haha! Thanks so much, your tacos look insanely fantastic and can’t wait to give them a go! You can give Cold Storage at Plaza Singapura a shot (I saw some on display the other day). I bought mine from Jason’s City Hall. Hope you are able to find them! Hi. Sorry if I blow my own trumpet but we have been importing Mexican food into Singapore for more than 10 years. We also were the first ones to set up a tortilla factory here. We stopped manufacturing a couple of year back but we know import our corn tortillas from Mexico. We also have the authentic Maseca corn flour (very oddly known as ¨masa harina¨ in the States) and a full range of Mexican ingredients. We have a physical shop in Ridgewood Condo (yes, in the condo: there is a retail block here) as well as an online shop. You can google Belmonte Latin Foods and you will find us or like us on Facebook for the latest updates. Come on weekends for real tacos as well!